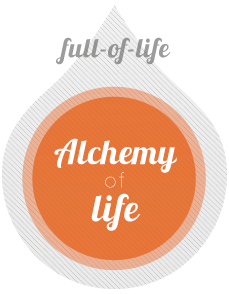 What is Alchemy and Alchemy of Life, what is your Life Project? Alchemy of life meditation and life force ritual. The true nature of male / female and the alchemy of the man/woman-relation and four-dimensional life. Bringing natural structure in yourself, how you act and how you live. The art of multi-dimensional and visionary life. Create balance between change and clarity in the form. Alchemy of Bodywork. Discover the body as a source of vitality. Meridian Chi Kung: transform your body and mind as a reflection of the quality of your soul. Why do I live? Discover your core value and learn to live from your heart. Living fully and cultivating health. Living inspired in the presence. Becoming the center point of your own life. Natural nutrition according to the five elements. 9 Star Ki Astrology (find out what your natural strength is and what can be developed more deeply). Make your life real and living in truth. Bring your life project in motion. in freeing his/her "true self"
"Alchemy of Life is a journey that you experience every day. 10 intensive Saturdays, which until today have seeped in. For me it's a journey through the different elements in myself. A journey that makes you sink deeper, as it were inner layers that bring you step by step closer to your heart. And from there allows you to feel everything around you, really connect with people, nature, the 'chemistry of it all. "It all comes to experiencing and to tasting it yourself... where do I stand? What do I need? Where do I want to go? The answers follow automatically."